Book: 'Say Nothing' By Patrick Radden Keefe Is A Warning That Ireland's Old Wounds Are Easily Opened New Yorker writer Patrick Radden Keefe excels at exposing the past as he tells the story of Jean McConville, a mother of 10 who disappeared after masked men abducted her during Ireland's Troubles. Of the great disappearances in Argentina and Chile in the 1970s and '80s — during which tens of thousands of people were taken from their homes and never seen again — Argentine-Chilean-American writer Ariel Dorfman wrote, "You cannot mourn someone who has not died." The number of "disappeared" was much lower in Northern Ireland during the Troubles — the 30 years between 1968-98. Sixteen people were "disappeared" during that time. But the sentiment still applies. 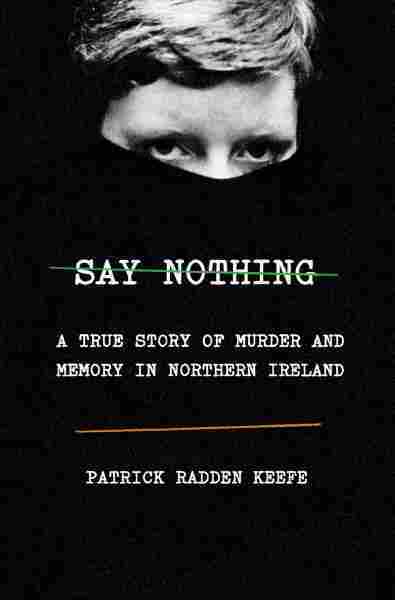 In Say Nothing: A True Story of Murder and Memory In Northern Ireland, New Yorker writer Patrick Radden Keefe tells the story of Jean McConville, a 38-year-old mother of 10, who was taken from her home in Belfast by masked intruders one night in 1972. It was nearly 31 years before her children could truly mourn her: Her remains were found in 2003, buried on a beach, just south of Northern Irish border with the Republic. She had been shot once in the head. Few people were surprised when Jean McConville vanished. Everyone knew who had taken her — and why. She lived in a tight-knit Roman Catholic community in Belfast called the Divis Flats, but she was born a Protestant. The word was that she had become a tout: an informant for the British Army. The discovery of her body 31 years after the fact simply confirmed what everyone already assumed. That the Provisional IRA had abducted and murdered her. But who actually pulled the trigger? Say Nothing switches back and forth between the mystery of who killed Jean McConville and the wider history of the Troubles. As a historian, there's no mistaking his bias: Keefe is contemptuous of the British government and the security services, and he venerates the Provisional IRA. As the narrator of a whodunit, however, he excels, exposing the past, layer by layer, like the slow peel of a rotten onion, as he works to answer a question that the British government, the Northern Irish police and the McConville family has been seeking the answer to for nearly 50 years. Keefe draws the characters in this drama finely and colorfully: Brendan Hughes, one-time commander of the Belfast Brigade of the Provisional IRA and hunger strike leader, is a boisterous, devil-may-care risk-taker; Gerry Adams, the former IRA commander and Republican politician who was arrested in connection with the murder in 2014, and released without charge, is a smooth, Teflon-coated enigma; Dolours and Marion Price, sisters who joined the Provos in its early days, live up to their nickname, the Crazy Prices, after a local supermarket chain. Jean McConville's son Michael, who was brutalized in an orphanage home run by the priesthood, seems to represent the whole province of Northern Ireland: A deeply scarred man who finds comfort in sport — in his case, racing pigeons. Keefe is a meticulous researcher, whose dive into the source material that informs so many histories of the Troubles goes deeper than most. Say Nothing is at its best when it's at its most granular. Some of the details are delightful, like the story of the attempt by a British Army unit to get food to an operative watching an IRA target. They bought him a packet of fish and chips and tossed it into the bush where they thought he was hiding. Unfortunately, it was the wrong bush. Other details are chilling in their banality, like Dolours Price's recollection that the IRA's improvised explosive devices, which she and her sister used to ferry across the border, smelled like a cake decoration. Jean McConville's body was only found because of a storm, which washed away the surface of the beach on which she was buried. The Troubles had ended five years before, with the signing of the Good Friday Agreement, but the discovery was a reminder that the people of Northern Ireland had a great deal of suffering still to do. With some of "the disappeared" still missing today, Say Nothing is a reminder of Northern Ireland's ongoing trauma. And with Brexit looming, it's a timely warning that it doesn't take much to open old wounds in Ireland, and make them fresh once more. Paddy Hirsch is a supervising editor for NPR's Planet Money. You can follow him on Twitter @paddyhirsch.